Product #18303 | SKU HXR-MC2500 | 0.0 (no ratings yet) Thanks for your rating! 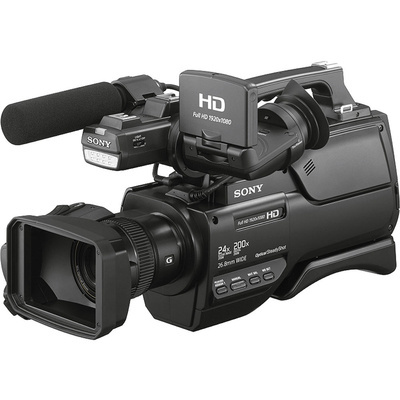 The HXR-MC2500 Shoulder Mount AVCHD Camcorder from Sony is designed for shooters looking for the inherent stability and professional feel a shoulder-mount form factor provides. It features a 1/4" / 0.64 cm Exmor R CMOS chip that can work with as little as 0.8 lux illumination when in SD mode, and low light performance is further augmented by a built-in LED light shinning 800 lumens at 1.6; distance. The camera records Full HD in the widely supported AVCHD format and can record SD in the DV codec with an AVI wrapper. The camera is Wi-Fi enabled allowing you to control it from an app as well as monitor a low-latency live feed on a smartphone or tablet. For live monitoring, there is an HDMI output. Video can be recorded internally to the 32GB flash memory, which stores about 170 minutes hours at the 24 Mbps (FX) quality setting, or a SDHC/SDXC or MemoryStick memory card.